We’d love your help. Let us know what’s wrong with this preview of Disturbingly Beautiful by J. Wells. As Nell’s world opens up, we follow her on a complex journey, on which she discovers love, loss and betra Is it really possible that somewhere in time, the perfect paradox could be created? Does romance really stand a chance, and could it ever flourish amidst so many intricacies and broken lives? How can a nineteenth-century governess unknowingly cause so much devastation? To ask other readers questions about Disturbingly Beautiful, please sign up. Is it out? When? I'd like to read it and Amazon doesn't seem to have it. I started reading Disturbingly Beautiful and I immediately loved the writing. In the prologue I've read a little part about books and I felt so related to Nell. Sometimes I wish I could just open a book and live the life of that character. A warm glow inside ignited her imagination, throwing her into a fictional world where books, lines and chapters from the countless book she had read came to life, filling her mind with hope. In the first chapter, Nell says something about books and it's just me. She loved books, and marvelled at the dark mahogany bookcases that swept their way around the walls. Books were both her companion and passion, and had been since childhood; they opened her mind and filled her heart with wonder. After those two quotes I started to like Nell more and more. When Nell met Jeremy, everything changed in Nell's life. When she touched his arm, they went to the 20th century. Everything was different for a 19th-century-girl. But she could not stay in the 20th century when the man she loved, could not love her. Back in the 19th century, Mr. Buchannan is asking for Nell's hand. He loves her. My love, that one drop of blood lying between millions of snowflakes is how you stand out above all others in my heart. He will try anything to make her love him. You must have no fear of me loosening you, for I shall never let you go. But can Nell love him? I'm not used to reading this types of books, but that doesn't mean I don't like these types of books. I loved reading Disturbingly Beautiful and I cannot wait to read Disturbingly Divine!!! 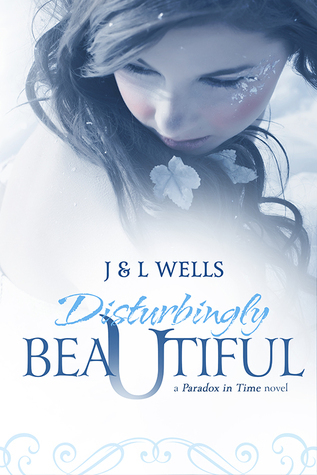 'Disturbingly Beautiful' is the enchanting first book in a New Adult time travel romance series. It follows the main character - Nell - as she goes about her life as a governess at Haunchcroft estate after her charge, Abigail, has passed away. It doesn't take long before the master of the house, Mr. Buchannan, begins to make intimate advances towards her. Nell finds her master to be a handsome man, but doesn't like his character or personality. His advances towards her are unwanted, but he doesn 'Disturbingly Beautiful' is the enchanting first book in a New Adult time travel romance series. It follows the main character - Nell - as she goes about her life as a governess at Haunchcroft estate after her charge, Abigail, has passed away. It doesn't take long before the master of the house, Mr. Buchannan, begins to make intimate advances towards her. Nell finds her master to be a handsome man, but doesn't like his character or personality. His advances towards her are unwanted, but he doesn't seem to care. As the time passes, Nell begins to realize that she has been at the center of an intricate plot the family concocted - and that she will never be allowed to leave the estate as promised. When an intruder on the estate comes across Nell on accident - she chases him through what turns out to be a rip in time. On the other side of this opening, she finds a world completely different than her own. One where women have rights of their own, equality with men, and are listened to with respect. It's here that she also stumbles upon a true friend and gains a whole new outlook on life. One thing Nell never expected - aside from going through a rip in time - is finding herself in the future time with her unwanted admirer and master from her own century. Why is he there alongside her in this far-away and distant time? Is he the same person as the man she knows at Haunchcroft estate with his cold and distant demeanor and unwanted advances? Or is this future version a completely different man - one that sees her in a whole new light? Could this man possibly be the same one from her reoccurring dreams - her true love? I'm usually a huge sucker when it comes to true love and romance in books, so it's no surprise that I loved that aspect of the story in this one. Aside from the romantic aspects of the story, I was fascinated by the opening/rip in time that Nell goes through. It's mysterious and defies every possibility, but I really enjoyed seeing Nell in the future - with all the women's rights and advances in equality that seemed impossible to fathom in her own time. She reacted pretty much how almost everyone would in a situation like that, so even that crazy part of the story line made Nell all the more realistic to me as a character. She's a great lead for the story - smart, determined, honorable, kind, loving, and devoted. She has her flaws just like everyone else, but these only served to make her easy to identify with. I haven't read many time travel books, so I'm always intrigued by how the author fits it into the plot, along with all the details surrounding it. Every author has a different perspective and way of writing about time travel, and I find it interesting to compare them to see what they have in common as well as what's different. The writing was well done with a natural pace and easy flow with great use of imagery and detailed descriptions that makes the reader feel like they're inside the story beside Nell. There were some parts that felt a bit slow to me - they kind of popped up here and there throughout the book - but that's just my personal opinion and it didn't effect my reading experience very much. I definitely recommend this book to fans of science fiction, romance, and time travel lovers. This is a great start to a series that has loads of potential. I'll definitely be reading the sequel when it comes out. The year is 1813 and Nell Dodsworth is a twenty-six year old governess at Haunchcroft Estate whose ward, Abigale, has just died. Abigale's father, Mr Sebastian Buchannan, makes unwanted advances and calls her "disturbingly beautiful". One night, Nell follows an intruder and the repercussions of this decision will affect the lives of many for years to come. The stranger is Jeremy Chambers, a time traveler she somehow travels forward with in time to 1968. While Nell ends up falling for him, Jeremy The year is 1813 and Nell Dodsworth is a twenty-six year old governess at Haunchcroft Estate whose ward, Abigale, has just died. Abigale's father, Mr Sebastian Buchannan, makes unwanted advances and calls her "disturbingly beautiful". One night, Nell follows an intruder and the repercussions of this decision will affect the lives of many for years to come. The stranger is Jeremy Chambers, a time traveler she somehow travels forward with in time to 1968. While Nell ends up falling for him, Jeremy remains unmoved, mourning the loss of the mysterious Mirren. What are Jeremy's motivations for manipulating time? And what other secret is Jeremy keeping from Nell? When Nell returns to her time, family secrets are hinted at and later revealed. When she once again travels into the future (this time to 2014), she discovers just how her time traveling has affected the lives of others. Will Nell ever be able to set things right? This book has a few problems, including editing errors, unsympathetic characters, and a lack of cohesion between the different story lines. The book gets off to a very slow start, but progresses more quickly when Nell travels to the 1960s. While her visit to the future is interesting and her old-fashioned language and conventions are quaint and amusing, the whole thing just doesn't ring true. I would expect her to show more amazement at how much things have changed since the 1800s. This time travel episode is also quite long, and there doesn't seem to be much point to it. Nell's second visit into the future is even more unsatisfying, although everything seems to come together in the end. Overall, this is an interesting and entertaining read. Even though it is the first in a series, the story in this book is complete. An 19th century story of intrigue and romance straight out of Gosford Park that was slightly hampered by confusing time travel. Overall, not a bad read but almost felt like 2 separate stories. Full review here at SeeKikiRead.com. Thoroughly enjoyable!! Historical Regency meets Sci Fi time travel. A proper waltz right into the psychedelic sixties!! Nell travels into the future, back to the past, and back once again. In what century will Nell find her happily after? Disturbingly Beautiful took me on an extraordinary journey of love through time. Boy oh boy. Talk about the shocks and surprises in this book. I can't tell you how many times I was left completely shell-shocked. There are so many secrets and twists in this book that left me on the edge of my seat the entire time. I constantly had to know more. Had to know what happened next. The world-building was well developed and crafted beautifully. I was able to vividly see what was going on in the story. I Disturbingly Beautiful took me on an extraordinary journey of love through time. Boy oh boy. Talk about the shocks and surprises in this book. I can't tell you how many times I was left completely shell-shocked. There are so many secrets and twists in this book that left me on the edge of my seat the entire time. I constantly had to know more. Had to know what happened next. The world-building was well developed and crafted beautifully. I was able to vividly see what was going on in the story. I felt as if I was apart of the story. The character development was spot on!!! Each character showed a lot of growth by the end of the story, and that is very important to me. Nell hated Mr. Buchannan with a passion. No matter what advances he made toward her, she shot them down. That's how much she couldn't stand him. Items started to go missing and Nell chased the thief all the way to 1968. Let's face it, 1968 is completely different from 1813. Everything was completely different. Her lifestyle had to change and she enjoyed learning new things. She was slowly easing into this new way of life, of being free. She became great friends with Jeremy, but after breaking her heart she goes back in time to 1813 to start where she left off. I hated how she left Jeremy. He is one character that I would love to see more of. He was so happy to finally bring someone in time with him. It gave him hope of putting a paradox in time to change something that he regrets more than anything. Anyway, after Nell goes back home and into the arms of Mr. Buchannan who she is falling for, secrets become known. Nell realizes she is in the middle of a sinister arrangement and decides to flee. Only this time she shows up in 2014. Everything has changed. All the characters she met in 1968 are gone and old. And this time, Mr. Buchannan follows her. Nell was a character that I easily fell in love with. She was strong, caring and independent. She didn't let anyone change who she was. I loved watching her friendship grow with Jeremy. I loved Jeremy and I definitely want to know what happened to him. I also loved watched Nell's and Mr Buchannan's relationship grow and develop. Nell slowly realized that he wasn't all what she thought he was. That some of the secrets painted him in a new light once revealed. Mr. Buchannan really fell for Nell. He did whatever he had to do to make Nell his no matter how drastic it was. But that is where all the secrets lie. He did whatever he had to to protect Nell. I loved him for that. It was so nice to see his soft side. I'm not even sure where to start with this book, it was such a mess. The plot was confusing, the writing was overblown and the main character, Nell was unlikeable. I guess you can tell I didn't like it. First the plot. I will admit that I was intrigued by the description of the book. I love time-travel stories but this just didn't work. Nell somehow stumbles into the 20th century. We're not given any clear explanation of how it happens or why. Jeremy, the man who brings her through to the 1960s, has found a way to travel back in time, but we don't know how he does it or why he is stealing objects from the house, Haunchcroft, that Nell lives in but which is a University in the 20th century, that Jeremy works at. See! Confusing. Nell then goes back to the 19th century where we discover some evil scheme has been hatched to marry Nell off to the youngest son of the Earl. At this point she runs away and ends up in the 21st century this time. I gave up at this point. I just couldn't read any more, it was giving me a headache and made me want to stab myself with something. "Her doll-like complexion made its way into Jeremy's awaiting eyes"! This doesn't even make sense. "His eyes almost pirouetted on their meeting". Just a tip, if you can't actually do the actions you are describing then don't use it. Lastly, the characters, especially Nell, the "heroine". What a brainless ninny she is. There is absolutely nothing likeable about her. She doesn't seem to be able to make a decision about her feelings. One minute she's in love with Mr Buchanan and the next she hates him. Then she loves Jeremy but runs away from him. I think the thing that I found most annoying was that there was no motivation for the characters actions. We never get any real background or understanding of why the characters are behaving the way they are. What emotions are driving them to react to the situation they are in? Ultimately I couldn't connect with the characters and I really didn't care about them. A good editor could have made this book infinitely more readable. Nell was the governess to Mr Buchannan’s daughter Abigale. After Abigale succumbed to pneumonia Nell decided that with her education that maybe it was time to change what she did, it hurt too bad to lose someone that she cared so much for. Maybe she could teach instead it was something that she needed to decide but not right away. Mr Buchannan’s offer to her to stay until his sisters arrival and his recommendation for her to become governess to her child was something that she needed to think about. She decided to stick around but after the confession of finding her disturbingly beautiful that he told her she decided that she needed to stay away from him even though he was very pleasing looking he still made her uncomfortable. His sister would not arrive for a couple of weeks so she took this time to further her love for reading losing herself in the fictional stories. She did have a very vivid imagination and at times she found herself reliving one in particular. Finding her real TRUE love! What did I like? The first thing that I like is that this is my favorite genre, time travel. Of course, it is even better when they include two things, romance and mystery. This story has just that. Starting out in the 1800’s is another era that I really like and intrigues me, also having the lead man very handsome does not hurt either. What did I dislike? Well, the only thing I can think of is that the lead character was not me. I would love to first live during that time but second be able to time travel. Maybe it would be wise for me to start in the 21st century go back to the 18th though. Nell Dodsworth is a young governess without A delightful read full of surprises! When I first saw this book I though, WOW an amazing cover and I can’t wait to see what this book is about. Then I read the summery and thought it would be extremely interesting reading a story that involved time traveling; this was the first book that I have experienced with this. There were three different time periods that the book traveled to; 1813, 1968 and 2014, all three very different from the other. During this time, the main character Nell had gone through a huge amount of growth, from When I first saw this book I though, WOW an amazing cover and I can’t wait to see what this book is about. Then I read the summery and thought it would be extremely interesting reading a story that involved time traveling; this was the first book that I have experienced with this. There were three different time periods that the book traveled to; 1813, 1968 and 2014, all three very different from the other. During this time, the main character Nell had gone through a huge amount of growth, from being a naive woman to one who travel through time and found out new things about her life and what life could be in the future. I even think that I had seen some growth within Mr. Buchannan, who was very interesting to figure out. I like that this book kept me guessing, I never knew what was going to happen next. All the plot twists were quite the shockers!!! I believe this is what made the book so enjoyable to me. I have read many books where I have not been shocked and surprised by the events that occurred and the ending, but this one definitely did. I'll start with I've never read a book in this genre before so I have no idea what to expect. I think readers who enjoy time-travel and historical romance will enjoy this so pick it up! :) That being said, I enjoyed this but I was confused at times. I was kind of all over the place (I'm not used to reading books set in 1800's) but I kept going. This book has some humor, romance and loss. And that cover is beautiful. I admit, I picked this up because of it. I don't know if my review will help because I'm not used to this type of genre so I don't know if the authors hit the mark on what they wanted to do but the writing was really good with details that the reader will enjoy. I had the privelege and pleasure of reading an advance readers copy of this book. It is one of the best books I have read of it's genre in a long time. The characters are complex, the plot is captivating, and the subtle twists and turns of the plot make the book exciting to read from beginning to end. There is humour, heartbreak, deception, romance, anger, happiness and grief, this book has you feeling the gamut of all these emotions. Once I started the book I didn't want to put it down. I absol I had the privelege and pleasure of reading an advance readers copy of this book. It is one of the best books I have read of it's genre in a long time. The characters are complex, the plot is captivating, and the subtle twists and turns of the plot make the book exciting to read from beginning to end. There is humour, heartbreak, deception, romance, anger, happiness and grief, this book has you feeling the gamut of all these emotions. Once I started the book I didn't want to put it down. Before I even dive into this review, I think that it needs to be said that this cover is absolutely amazing. I loved it! Unfortunately, that's where my love for this book begins and ends. Picking up this book, I had hoped for something like the historical romance novels that I love so much. But that wasn't what I got. The beginning was a bit boring and confusing, I never really knew why the character would be in one room one moment and then it would totally just skip to a part where she was in another room. It just didn't flow. At all. It was reminiscent of when I started driving ... pushing on the gas hard just to push on the brake hard and then I end up with whiplash, one less person willing to teach me to drive and the next door neighbor's cat is roadkill. The flow part made it incredibly boring. That being said, I think that the idea behind the book was really interesting. I haven't read anything like this and I ended up putting all of my eggs in one basket. Then the fluffy kid down the street sat on my basket and those eggs were toast. I also thought that the future part was ... yep ... boring. And random. It was just in the 1800's and then all of the sudden, you're in the 1960's with this weird dude who doesn't even know what he's talking about. It was just weird. Independent Reviewer for Archaeolibrian-I Dig Good Books. I don't like to write bad reviews, and if this had been one of my books, I would just have starred it. But its a read-for-review book, so I've got to give my honest opinion. And here it is. I did not like it. At all. And whats bothering me the most is, I cannot pinpoint why. Its relatively well written, with only minor spelling/editing errors, not enought to put me off. Its written from Nell's POV and only her's. I don't much like single pe Independent Reviewer for Archaeolibrian-I Dig Good Books. Its relatively well written, with only minor spelling/editing errors, not enought to put me off. Its written from Nell's POV and only her's. I don't much like single person POV's but its not the reason here, that I dont like it. I think, for me, the main issue is the plot. It didnt flow, it jumped and hopped from 1813 to 1969 back to 1813 then to 2014 and then back again to 1813. BUT I'm not really sure HOW she jumped from each time line and back again. Nell spent time in 1969 and she became accustomed to the way of thinking, speaking, acting and dressing of that time. YET when she returns to 1813, aside from finding her voice and speaking her mind, Nell reverts straight back to THAT time line's way of thinking. And that didn't feel right, at all, to me. Its so clean, its almost spotless and I would quite happily let my 13 yr old daughter read it, if only for the historical content and how women were expected to behave in the early 1800's. I've filed it on the Young Adult shelf, and the Paranromal shelf, as I dont have a time travel shelf. Some will, undoubtably, 5 stars this book. I cannot, however, in all honesty, and thats what being a reviewer is all about. Being honest. Please excuse my rant but this is a joke! It's a joke right? I'm not into the whole time travel thing, and thanks to this book, I don't think I ever will be. There were way to many characters so you don't get to have a bond with any of them. All the men seem to be nothing but pigs and Nell had no backbone. She was weak and got kicked around and never fought back. It all just irritated me to no ends! And ho I received this book VIA NetGalley in return for an honest review. I'm not into the whole time travel thing, and thanks to this book, I don't think I ever will be. There were way to many characters so you don't get to have a bond with any of them. All the men seem to be nothing but pigs and Nell had no backbone. She was weak and got kicked around and never fought back. It all just irritated me to no ends! And honestly through most of the book, it was information overload. There were thing just thrown in there to be there for no reason. It honestly put me to sleep. I wouldn't recommend this book. Even to time travel lovers. Sorry. "Disturbingly Beautiful," by J. And L. Wells is terrible. Awkward, overwrought wording is used in an attempt to capture early 19th century England. Unfortunately, it just interrupts the flow of reading with its oddness and incorrectly used words. The characters and story are poorly developed, so the story never gains traction and becomes interesting. The heroine is a mess, she drastically changes her opinions and behavior from moment to moment. Disturbingly Beautiful was a glorious and rich read. I enjoyed it far better than The Untimely series, and I loved those books! With the perfect mix of regency and time travel elements, it makes for an enjoyable read. There's a few twists and turns that make you cry out and yell at the book. I totally recommend this to anyone. I don't really like historical romance so I was liking the time travel aspects of this book better. The writing is good and the story is lush with description. Nell accidentally travels through time from the year 1813 to 1968. She adapts quickly to the future but poor Nell still has some troubles. I was feeling really sorry for her and wanted her to find her true love. 3.5 stars. A brilliant book well written with a can't put it down storyline with a twist.